I did this exact thing in a Thai restaurant once. I felt sheepish. Yeah this could easily be "Anywhere in Asia"
"Szechuan"? Seriously? Isn't this supposed to be an internationally aware, hip, modern comic? 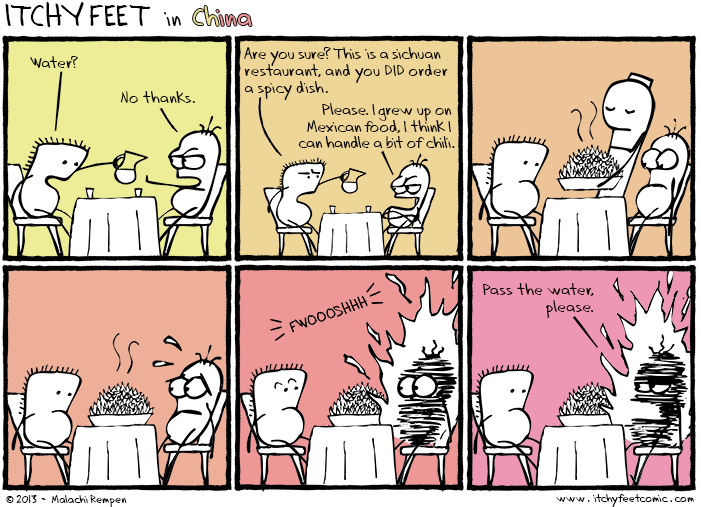 It hasn't been called "Szechuan" since 1949. It's Sichuan. We're not even mentioning the borderline racist slanty eyes on the waiter. WTF? You're right about the spelling. I did a cursory google search when writing it, and that's what came up first. I fixed it just for you! Maybe now you won't be such a sourpuss. Also, if you know anything about Itchy Feet, I never draw races differently except sometimes the clothing. The waiter's eyes are closed, not "slanty." YOU'RE racist for even thinking that! Get off my website! Don't worry man. I'm Chinese and didn't get the memo that Szechuan is now Sichuan. Like Chang is now Zhang too but that doesn't make it racist or anything. And when you're Romanizing non-Latin-alphabet characters, spelling is generally optional anyway! (At least in this country!) My students spell their own names differently every time they turn in papers. If this was in China, it'd be warm water in the glass, too! You're right, the food there is insano-level hot. Anyway, I've learned a simple tip to help with spicy Chinese food: 1) Don't order it, or if that's not an option... 2) DON'T drink water at first, it only spreads the burning. Instead get some clean (as in, not yet covered in sauces) rice, which will absorb some of the spicy stuff in your mouth and actually relieve the pain. Yeah it makes sense if you think about it: "spiceness" is chile oil, so of course if you add water, it'll just spread the oil around. Something like rice or bread will soak it up and absorb it, like other oils. I just used water in the cartoon because, well, it's a cartoon. The most intimidating dish I've seen is laziji, which is a pile of chilies with pieces of fried chicken hidden somewhere. I think I've had laziji! That's what the dish in the picture is supposed to be. Just a giant plate of little red chilies, and you have to pick the meat out, right? Crazy.